Team is an English word that refers to a group of people working together. Today, there are many synonyms that mean the same thing: équipe, squad, staff, group, etc. I think that a group of people should mainly share an idea, a project, a philosophy that convey the company’s mission statements. People are central to the operations of a business in a liquid modernity (as the philosopher Zygmunt Bauman wrote) where everything runs fast like a post on the Facebook wall. The value of work must be understood as an integral part of oneself, as a development of the professional growth, as a means of wealth for one’s own family and at the same time the company. I believe that in the humanity’s uncertain future marked by the economic crises, the disintegration of the political ideologies, the environmental disasters, fears of the others and the strangers, work is a common good. 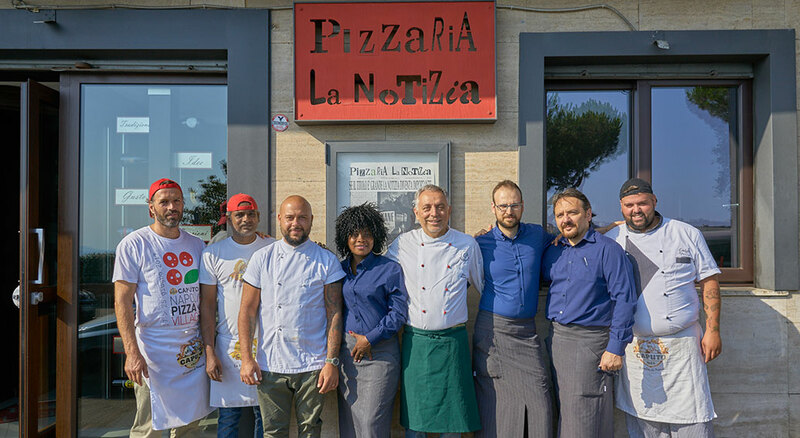 In Italy, with regard to the pizzeria field, we don’t have to worry as there has been a growing demand in the last 10 years, with a supply of thirty thousand food businesses. Every day, I work in my pizzerias with people having different personalities and different cultural, ethnic and religious background and, with them, I would like to share and thank for “50 Top Pizza” prize that I got yesterday at Castel dell’Ovo. A good Swiss watch powered by a manual-winding movement works when the smallest of its gears counts the number of seconds properly. As Primo Levi wrote in “La chiave a stella” [literally “star-shaped key”] “loving one’s work (which unfortunately is the privilege of a few) is the most concrete approximation to happiness on earth: but this is a truth of which not many are aware”. Thank you boys and girls of pizzeria La Notizia!